History: Appears to have been created after 1988. 4xx numbers are used for new routes in this area. History: Originally the northernmost segment of NM-120. Renumbered in 1988. History: Appears to have been established as a state highway in the mid to late 1990s. The access road to the state park was there for many years before. Photo taken east of the junction with NM-551, near the dirt segment of this route. History: This road was the original route of U.S. 64 from Raton to Oklahoma. In the late 1940s, when U.S. 64 was rerouted along existing U.S. 87 to Clayton, this road became NM-325. 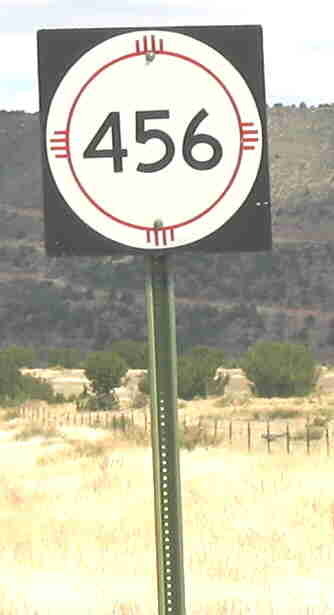 In 1988, the portion of NM-325 from Folsom east was renumbered as NM-456. Improvements: Paved, two lane except for gravel section about 17 miles long east of the junction with NM-551. Comments: More or less follows the "Dry" Cimarron River. This is a road that I believe should regain its pre-1988 designation, reestablishing NM-325 as a continuous route from Des Moines to the Oklahoma border. It's an absolutely beautiful drive through the mesa country of far northeast New Mexico. History: Established late 1950s. Appears to have been a new road constructed through oilfield country on the Llano Estacado. History: This road was originally constructed in the late 1950s as the new alignment for U.S. 80-85, angling back to the original alignment just before it entered Texas. I-10 was then constructed over the new alignment and extended south into Texas. I believe for a short time this road continued to be U.S. 80-85 until the early 1960s, and then U.S. 80-85 were rerouted onto I-10. New Mexico had numbered the old alignment for U.S. 80-85 south of Las Cruces as Alternate U.S. 80-85, but that route became NM-478 in the early 1960s. For a time, Texas maintained the Alternate U.S. 80 designation on old U.S. 80, and this road connected Alternate 80 to U.S. 80 along I-10. By the mid-1960s, this route was designated NM-460. This connected with I-10 at a trumpet interchange (exit 160), but around 2000 this interchange was eliminated, probably to allow construction of a large truck port of entry at this point. A new interchange at NM-404 (exit 162) was constructed in its place. The state road, however, appears to continue to the frontage road. Comments: Although the interchange with I-10 is gone, the latest New Mexico highway map shows it as being in existence. Comments: In the 1930s, U.S. 54 passed through Coyote. Due to its length this route does not show on most maps, and I believed it to be out of existence until finding it on the state route log. History: Established late 1950s, probably at the same time as NM-461. Comments: In the 1930s, U.S. 54 passed through Ancho. Comments: Road was in existence prior to becoming a state road. History: In mid-1980s, established on St. Michaels Drive replacing former Bypass U.S. 85. U.S. 285 remained along Old Pecos Trail until the mid-1990s when it was rerouted along U.S. 84 on St. Francis Drive. At that time, NM-466 was extended along Old Pecos Trail southeast to I-25. History: Established late 1950s. Unchanged since that time. Photo taken at BL I-25 in Springer. History: Unclear as to exact date of establishment. 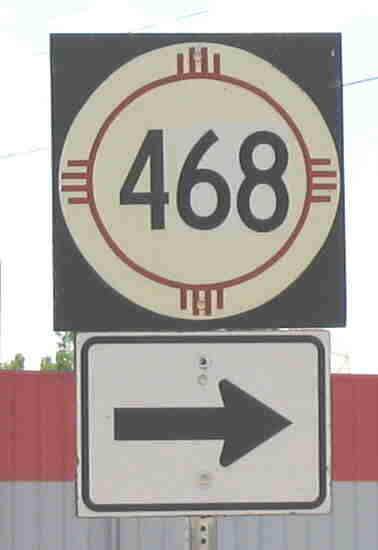 The route number is consistent with the 4xx routes issued in NMDOT District 4, but the first reassurance marker looks pre-1988 in appearance. Comments: Road continues to Springer Lake. This route isn't shown on any maps I have, but I found it on an on-line map, and it is also marked from both Springer exits off I-25. It does not have a direct ramp from I-25. History: Originally the southerly extension of NM-39 (since the 1930s). In 1988, it was redesignated because of the short common section of U.S. 54 and NM-39 at Logan. Comments: This route served as a shortcut for travelers following NM-18 up the east side of the state, avoiding the swing west to Tucumcari. History: Date of establishment not known, evidently pre-1988. May have connected to NM-422 before it was converted to I-25. History: Date of establishment not known, evidently pre-1988. May have connected to NM-422 before it was converted to I-25. Removed from state highway system by 2000. History: Established mid-1960s. Extended to U.S. 84-285, probably in 1988 when NM-22 was broken into numerous routes. Comment: Follows Paseo de Peralta around the north side of the Santa Fe Plaza, turns north briefly along Washington Avenue (Bishops Lodge Road), then east along Artist Road which becomes Hyde Park Road. This road now ends at the ski area, but at one time continued northwest and eventually intersected U.S. 84-285. (The state highway probably never went beyond the ski area). History: Weak evidence of date of establishment: the 1971 USGS topo map of Raton (small scale) does not show the route but the larger scale 1975 map does. No official state maps or maps from other publishers show it that I've seen. The road has not been in the state network probably since 2000. Its former extent on the west end is now closed with a gate west of County Road A-20. Improvements: Two-lane, paved in Raton, gravel west of Raton. Comment: This route most likely existed to serve the coal mines west of Raton. It probably went as far as what I think is a coal mining company town, Gardiner, which shows on older maps. I have seen this route posted on the USGS topo maps of the area (as noted above), as well as on Mapquest and Google maps. In Raton, it entered from the southwest along Red River Road then turned northeast along 5th Street. It turned here because until recent years, Red River Road did not connect to Tiger Road, which angles southeast to intersect at 2nd Street and Clayton Road (U.S. 64). How far NM-476 went along 5th is not at all clear; it must have jogged east to intersect 2nd Street (BL I-25 and old U.S. 85-87). A possible northern extent is Moulton St., since that road connects with the old Raton Pass Road. History: Established around 1960. Combined with existing NM-161 (creating a strangely shaped continuous route) in 1988. Comment: Just to repeat my comment at NM-161, I don't think this route should have been combined with 161. It should have maintained this separate identity. History: Originally part of U.S. 80-85 between Las Cruces and El Paso. Became Alternate U.S. 80-85 when a new alignment for U.S. 80-85 was constructed in the late 1950s, and by the mid-1960s was renumbered NM-478. Extended north through Las Cruces along Main Street (and on Water and Church Streets around the downtown mall) to U.S. 70 in the 1980s when U.S. 180 was overlaid on I-10 and U.S. 80 eliminated. Comment: Old (1950s and 1960s vintage) maps show this as 4-lane over much of its length. The only way that could have been is if the road squeezed four lanes into what is now two lanes and a decent shoulder. History: Only shows on the 1967 Santa Fe area detail map. Older maps of this area do not show this route, while newer maps don't have the same detail. This road does not show on current maps; in fact, the road that would be in this location is cut off by the state penitentiary. Thus, it's possible this road served the penitentiary for a few years before being truncated. Comments: It appears from older maps that a road on this alignment did not exist before the state highway was established. History: This road was the original route of U.S. 62 beginning in the mid-1930s when that route was extended to New Mexico, before it was realigned in the late 1930s or early 1940s to enter New Mexico on its more southerly route through Hobbs. Upon that realignment, this road was removed from the state highway system until the late 1950s, when it became a state highway. History: Date of establishment unclear; only shows on 1995 New Mexico road map. Probably 1988 or after because of 4xx number consistent with district-based numbering. Scheduled for exchange with San Miguel County, but retained in part with state turning back NM-232 instead. History: Does not show on older maps and thus (by its number) was probably established mid-1980s. History: Established mid-1960s, connecting NM-331 with NM-11. Removed from state highway system after 1999. No history of state routes with these numbers found. See for details of that route. Photo taken south of turnoff to Shakespeare - may not be on currently defined route. March 2008. Love the bullet hole! History: Probably established mid-1980s because of its number (a newer route would be a 1xx route). Southern part turned back to Luna County and now designated County Road A-016. Comments: Follows Main Street in Lordsburg. This is apparently not part of old NM-180, which went south of Lordsburg in the 1950s before construction of NM-338. Shakespeare is a "ghost town" that is open only about once a week to visitors. I have no history on the place but check their web site. History: Established mid-1960s, removed from state highway system by 1980. History: Established 1980s. Extended south from Deming about four miles, then east, then jogged south to the junction with NM-141,and east again to the junction with NM-143 near the state park, and finally south to the state park. The segment east of the current southern terminus was probably removed from the state highway system by 1995 (as shown on the 1995 state highway map), but the road between NM-141/143 and the state park may have continued to be an independent segment of this route until 2000. That independent segment was apparently renumbered as NM-198 around 2000 but is now part of NM-143. Last part of route was removed from state highway system by 2004. Comments: Not shown on current maps, but still marked (2004) in Deming. History: Probably established 1980s because of its number (a newer route would be a 1xx route). Portion south of NM-273 probably removed from state highway system by 2003, but was marked that year. Comments: Runs by Sunland Park Racetrack north of NM-273. South of this road, it was Anapra Road and passes through the village of Anapra. This former route deadends at a cul-de-sac at the Mexican border, where there is a tall steel fence marking the border. Behind the fence is a facility and a sign indicating that the facility is a Federal Police and Customs office. My guess is that there is a gate in the fence where deportees are returned by the U.S. Border Patrol to Mexico, rather than bringing them through one of the crossings at El Paso where there is only a cursory examination by Mexican border authorities. History: Established mid-1960s along Rio Bravo Blvd. Probably established at the time of or after construction of I-25, since this was the south end of the completed segment of I-25 through Albuquerque until the 1970s. Comments: Part of a planned route that will connect with NM-345 (Unser Blvd.) around the south and west sides of the Albuquerque metropolitan area. Interestingly, though, the route number is not marked at the interchange with I-25. It appears that a roadway has been completed west from the former end of Rio Bravo to connect with Central Avenue, which may be the first stage of this loop.